In a joint project focusing on incorporating 3D printing technologies into the production of plastic injection moulds, Prodways Technologies, Openlab by Schneider Electric and the Platinum 3D platform are teaming up to accelerate the development cycle of industrial products. One of the major challenges for the Industry of the Future will undoubtedly be to release new products onto the market faster in order to stay competitive. At the same time, international standards and certification requirements burden electricity manufacturers with long certification processes for their components, which must be produced using final material prototypes. In order to reduce time to market, the R&D departments of electrical component manufacturers such as Schneider Electric, a global leader, need to produce their prototypes fast in order to obtain certification and perform functional tests with the final material. 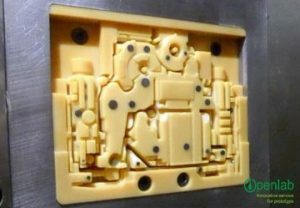 Consequently, the challenge is to be able to break free of traditional tooling – a long, expensive process – by creating the prototype moulds through 3D printing and to then inject final material parts and speed up the iterations needed to get certified before producing the final production mould. 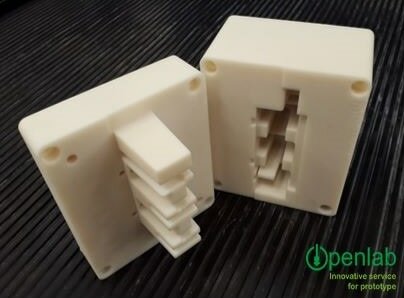 With this in mind, Openlab by Schneider Electric has been working with Prodways Technologies and the Platinum 3D technology platform for over a year to incorporate MOVINGLight® technology into the development cycle of its electrical components in order to print plastic injection moulds in 3D. Ultimately, nearly 25 tooling moulds were printed in 3D, and as a result, hundreds of parts could be injected on an injection moulding machine under manufacturing conditions in order to create parts that matched the final shape and complied with the certification prerequisites with the correct polymer grade. 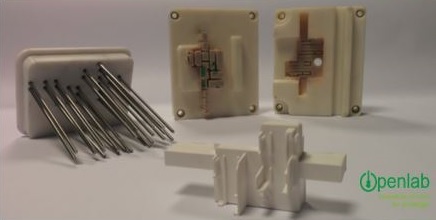 Thanks to Prodways’ 3D printing materials that boast high mechanical and heat resistance, Openlab by Schneider Electric and Platinum 3D have injected charged and nonflammable polyamide parts. Glass-charged polyamide is one of the most commonly used materials for technical components where heat resistance is mandatory; it is standard for many industries and an indispensable prerequisite for obtaining certifications. 3D printing, which is essential for developing industrial products, is therefore poised to play a key role in the growth of the businesses of the future. Through this partnership, Prodways Technologies, Openlab by Schneider Electric and Platinum 3D are reaffirming their central role as trailblazers paving the way to innovation in French industry. Openlab is a manufacturing accelerator for innovative solutions created by Schneider Electric and start-ups in the Grenoble ecosystem, which is the French region with the second-highest concentration of start-up incubators and accelerators after the Paris region. PLATINUM 3D is a technological, scientific and training platform dedicated to using additive manufacturing to create metal parts.